Following a series of incidents during the 2-1 win for Hibernian, a 19-year-old has been charged in connection with a hate crime and a 38-year-old was arrested in connection with the use of racist language. Another 19-year-old was also arrested over a flare being thrown and a 16-year-old was arrested in connection with a coin being thrown. And in the wake of those incidents, Budge stated on Thursday that a part of the Wheatfield Stand would be closed for the final two home games of the season with around 200 supporters moved elsewhere in the ground. 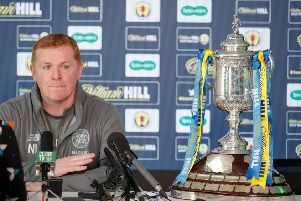 While manager of Hibernian last year, Lennon was struck by a coin thrown from the crowd at Tynecastle in an Edinburgh derby. Preparing his side for the William Hill Scottish Cup semi-final against Aberdeen on Sunday, he said: “It is a big call from Ann Budge but it has got be applauded. “It has been going on too much. “I don’t know how many times I have spoken about it, there seems to be an underbelly this season. “I was watching Motherwell versus Rangers last week and James Tavernier had objects thrown at him. It is totally out of hand. “Ann has come forward and taken some action. It will probably be detrimental to her but she seems to think that is the right thing to do. “It is unfortunate because a lot of good people go to football games and we are always talking about a minority but it’s got to stop.